Hey Everyone, Welcome to Our Glitter-Graphics Page! 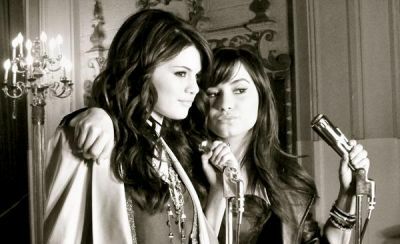 I'm Selena Gomez and I'm Demi Lovato, Sorry If you Get Confused Sometimes Lol. We Are Best Friends and We Make Silly Youtube Broadcast for Our Fans. Selena Has Her Own Show On Disney Called Wizards Of Waverly Place. Demi Has Her Own Show On Disney Channel Called Sonny With A Chance. When We Were 7 We Were On Barney Together And We Miss That. But Ever Sense Then We Have Been Inseprable and We Are Super Close BFFL's ^-^ Please Leave Us A Comment or Add Us. P.s Please dont steal our pics! Demi's Account is set as idol. Add her... I want to delete this if someone can tell me how. Login or register to add Demi & Selena as your friend!